Been on the road these last two weeks more than I have in my life, the van has put a serious shift in! I have done most the length of the country, as far a field as Yarm in the North East to Catford in South London, spreading the good word Cuckoo to all who wants to listen and those who don’t! It’s been a busy couple of weeks for events. I was invited to Northcote @ Blackburn Cathedral to showcase Cuckoo in association with Northcote and the amazing charity effort they are undertaking at the moment. Craig and Kay from the Northcote group are heading out to Nepal to support the Children of the Mountain Charity, we want to say best of luck from everyone at Brindle Distillery! I was lucky enough to have a lovely (and I mean LOVELY) three-course meal all made from the very capable hands of Lisa Allen and her team of superb chefs, a reyt good night. 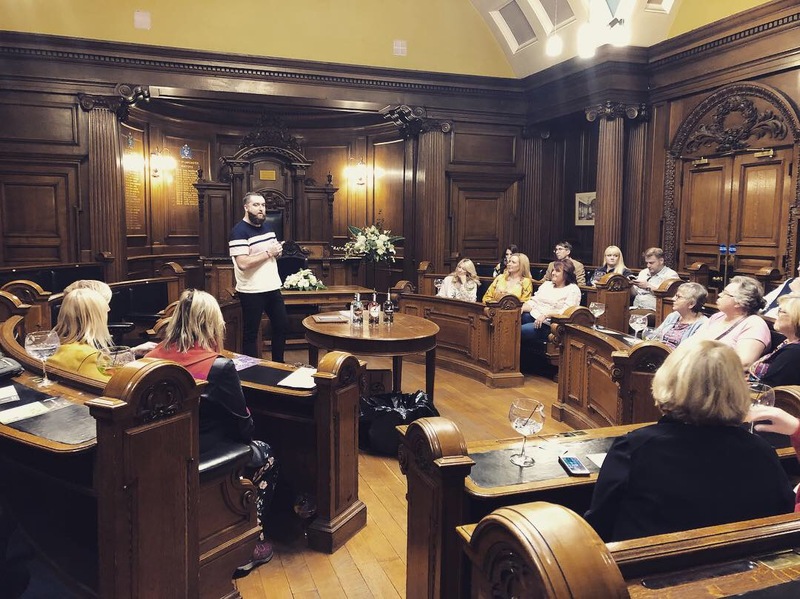 The same weekend I attended the Gin Society up in Lancaster, where I did my masterclasses in the old meeting room, it was very posh and I felt like a politician, only I was telling the truth in my speeches! Then it was onto Yorkshire, where we did the Trippets Gin Festival in Sheffield for the third time! We love this place, huge supporters of Cuckoo and we had a top day of selling and a great band on show as well! Then it was onto the big smoke, our third visit to London in as many months! This time I was in Catford, south of the river which is a first for Cuckoo! It’s class to see people enjoying Cuckoo in London, you grow up thinking of London as this magical place where the Queen lives and I have to admit I do love going there, its never been the same each time! We attended the Catford Gin Festival, hosted by the Forest Hill Gin Club. We met Simon and Charlotte at our first London event, Junipalooza, in June and then again at IMBIBE at the Olimpia in July. They invited us to attend their festival and what an event it was. We took down 100plus bottles of gin to sell over 3 days. I have to admit I had thought I would come back with a significant amount, but I shocked and stunned myself with how much Cuckoo was loved. We sold 50 bottles of Sunshine on Friday and Saturday, meaning I had one left for Sunday which was snapped up very early in the day! I only came back with one Spiced and 5 Signature, one of my most successful shows to date! It’s great for the brand, we are all committed to spreading the word as much as we can so to have people as far south as Catford enjoying a Lancashire product is just mind boggling isn’t it!? Lastly, myself and Mark have been really excited about a recent collaboration. We are now the home gin of Blackburn Rovers Football Club, with the next home game against Leeds you will find me giving a speech about Cuckoo in the directors lounge before the game! I had always imagined I would be doing a press conference after being scouted by Souness as the next home-grown talent but as it goes, this will do! Looking forward to working with the club we have grown up watching and loving. Until next time, keep an eye out for Workshop dates. We have done a few now and they are really good fun, get it booked in before Christmas!